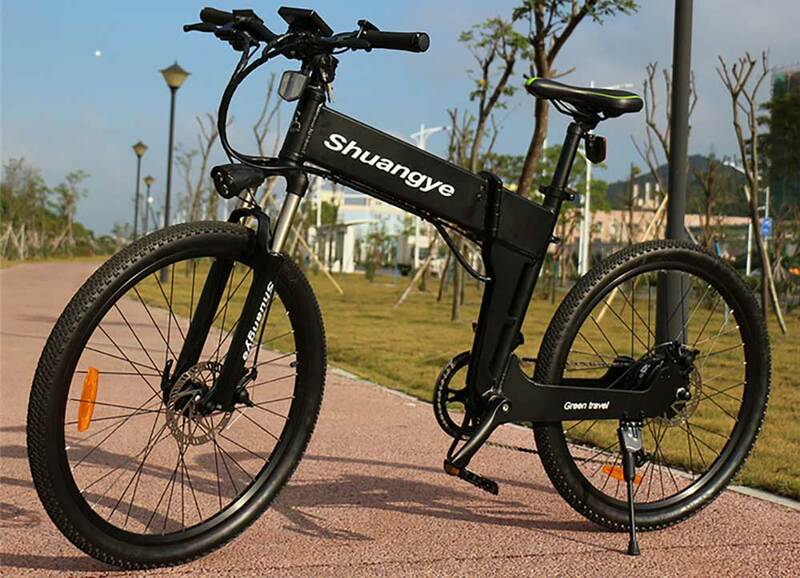 Compared with female, many males also like folding e-bicycle to ride around the city. Fat tire folding e-bicycle for sale is the best choice for those who have very limited space at home or work to store them. And the fat tire folding e-bicycle for sale has the same features as the mountain e-bike. But it is more suit to ride on snow road and forest road. It is a good way to exercise yourself. 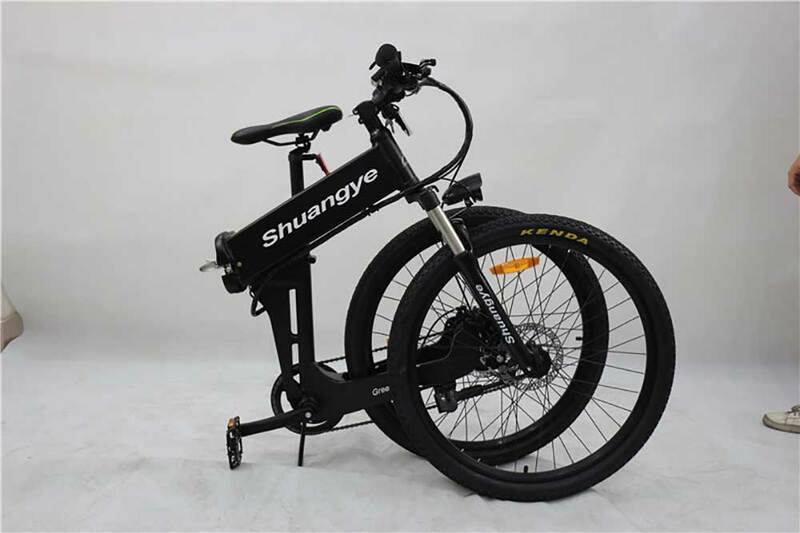 Shaungye G4-Z folding e-bicycle for sale is with 26 inch fat tires made up aluminum alloy. The fat tire folding e-bicycle for sale support folding which is its the biggest merit. Under this merit, you can fold this fat tire folding e-bicycle for sale and put it into the car trunk when you want to drive to outskirts to ride. The folding e-bicycle for sale really handy when combined with other types of transportation like train, bus, subway, car, taxi, etc. So the fat tire folding e-bicycle for sale is easy to take everywhere you want to go. The most interesting thing is the frame of fat tire folding e-bicycle for sale which look like a Z. It is difference from other fat tire e-bicycle frame. The 36V 10AH lithium-ion battery hide in the frame with locked which make the fat tire folding e-bicycle for sale looks concise. And the battery can move out to replace another same type battery to reduce waiting time. You can ride the fat tire folding e-bicycle for sale continuously. The fat tire folding e-bicycle for sale has a powerful brushless motor of 36V 250W which can also turn it into a non-electric bike when the battery run out of electric quantity. So you do not worry if the battery run out of electric quantity how do we do. About the electric power of brushless motor, we can also offer you 350W, 500W and other wattage motors. The main frame of fat tire folding e-bicycle for sale made up aluminum frame. The fat tire folding e-bicycle for sale use the shimano derailleur to give users a comfortable and excellent experience. For you safety, we install the reflectors on the seat post, front of e-bike and wheels. It can protect riders safety in dark environment. We also use 160 disc brake for front brake and rear brake which it better than V-brake. So you do not worry mud road and rainy weather, it can not damage the disc brake which is the disc brake merit. And the fat tire folding e-bicycle for sale has a LCD pass display that installed in the center of the handlebar, you can know the electric quantity, temperature, speed, motor power and so on. Based on the information, you can adjust your plan. We also have seat quick release which can adjust the seat post depend on you like and need. If you want to know more detail about fat tire folding e-bicycle for sale, please contact us freely.